مرشد کریم نے فرمایا !!! اس خطاب کے بعد فرمایا! مغربی کھانوں کی بات ہو رہی تھی فرمایا!! 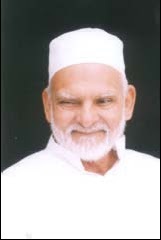 Sufi Books written by Patriarch of Azeemia Sufi order, Mr. Khwaja Shamsuddin Azeemi. He has been writing for years, more than 60 has so far been written by him. ‘Say – People! It has been made obligatory on you to make pilgrimage to the ancient house. answer to Hażrat Ibrahim’s announcement, and none else. invite the Hindu priest to lead the worship. is that it becomes clear from the Adhān that the start of every deed and the limit of every deed is Allah. are not pure and his mind is contaminated with sin then his mind will be devoid of peace and tranquillity. people. It is also obligatory on people to give the Muezzin respect and honour due to his dignified status.